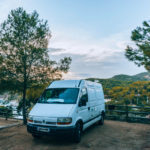 Your van life essentials are going to be a bit different wether you’re going to be living in a van full time or just for short period of time, depending on where you’re going to travel with your van, what kind of road trip you’re going to go on, the season, etc. 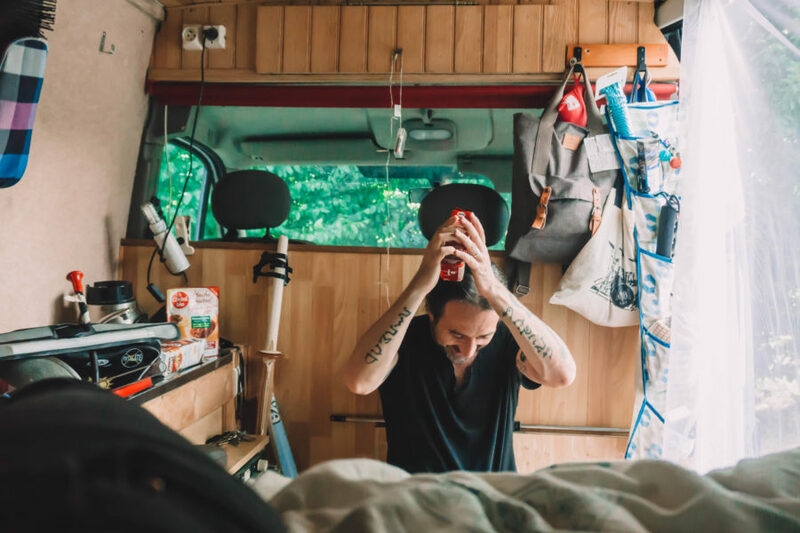 Here we tried to make a comprehensive list of the most essential items for a successful and comfortable van life, with options depending on your style and notes from our own experience living in our van full time for 4 months during the summer in Europe! • Comfortable bed: you’re going to spend a good amount of time on it, so it’s going to be much better if the mattress and the sheets are comfy. Don’t be cheap on the mattress, and then choose if you prefer to use regular bed sheets or your favorite and most versatile sleeping bag. Having a warm cover for the bed wasn’t very useful at the beginning of our trip but we just slept over it until it really became helpful once the nights started to get colder. Don’t forget the pillows! • A satisfying toilet system: if you drive around wild and mostly desert places, you won’t have much trouble doing your stuff outside, and you’ll mostly need a shovel to leave no trace. It wasn’t our experience at all, and what worked for us was to use public toilets as much as we could (obviously) and when we couldn’t: pee in a bucket (named by us the “pee-bucket” – some are made especially for that purpose), poop in chemical portable toilets that we emptied as often as possible, and systematically put the paper we used in the trash. Believe us, if you’re uncomfortable or unsure of where you’re going to pee/poop, you’re not going to have a good time. • A gas stove: A gas stove is the most helpful cooking item – with pots and skillet of course. As a matter of fact, we never used the two fridges that our van was equipped with. But we would have if our trip had been longer, because it really wasn’t practical not to use them. • A system to always have enough clean water: we didn’t really master that one, to be honest. A canister is always a good idea, and you have to remember to clean it regularly to avoid the proliferation of bacteria. • Light and power: soon enough, having just a couple of flashlights and battery powered stick-on ceiling lights inside and running on the cigarette-lightning chargers while we drove or charging the computer when we could stopped being enough for us. Especially as we started working on the road and spending more time inside the van. So a few well placed fairy lights, light strips and an inverter became some of our van living must haves! That’s our chemical potty Simone is sitting on! • A fridge / cooler: it’s a common van life essential cooking item, but as mentioned earlier we’ve never used ours. It only means you can do without it, if you’re going to travel short-term mostly or if you really have to go without it. A cooler might be of help, but in France it’s just really hard to get ice anywhere, so we didn’t bother. We had a cheap cooler bag at the beginning, that we used a couple of times. Otherwise we went to buy stuff when we needed it. 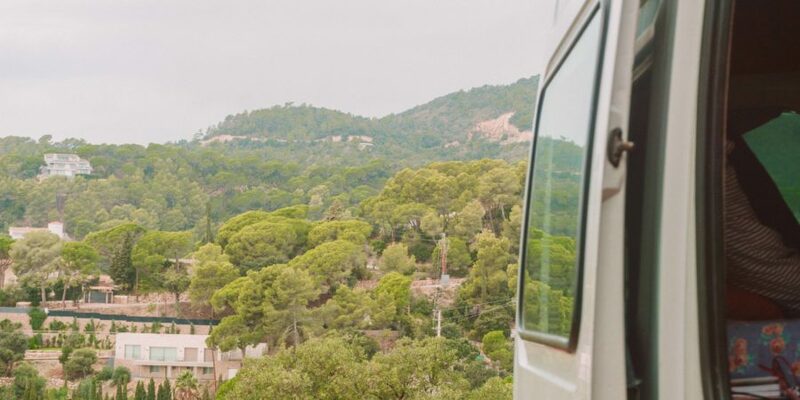 However now reflecting on our experience, we would definitely recommend using a dometic fridge (super efficient but expensive), a portable fridge (less expensive) or some kind of thermoelectric cooler – be assured we will in our next van! • A gas stove: Either it’s already built in your van conversion, or you’ll want to use a camping gas stove. But it’s an absolute must and it will be your best friend. • Pots and skillets: we used small inox pots (1 very small for heating water for a chamomile or something, 1 medium sized for small portions of food, and a bigger one when we needed the bigger size for our meal – if you’re by yourself stick to the smallest sizes, it will save you space) and a cast-iron skillet. • A cutting board: unless your van conversion comes with large kitchen space, a cutting board will be very useful not only to cut stuff but to help get more space to do your cooking. Just don’t forget to clean it really well as soon as you can. • A coffee press or a moka: We never go anywhere without Simone’s small Italian moka and it’s a really useful item if you like good Italian coffee: you just put some coffee, some water, put it on the stove and tada! If you like your coffee lighter, you’d better go with a coffee press (or ‘french press’). • And then of course all the little tools you’ll need like (for 2 if you might not be able to clean everything right away): 4 plates, 2 bowls, 4 travel mugs, 4 glasses, 4 knives, 4 forks, 2 big spoons, 2 small spoons, 1 big knife for cutting veggies, 1 big cooking spoon, 1 pasta strainer, 2 tupperwares, lighters and matches. • To clean up your dishes: some ecological dish soap, a dish strainer, a few sponges, towels to dry everything and wipe your hands. • As for the food itself: always have some reserves of at least semi-healthy long shelf life items like cans of veggies, cans of legumes (beans, peas, lentils,…), cans of ravioli (life saver), cereals (try to aim for the nutritive ones instead of the super sweet ones! ), clean protein powder (also helpful when you have a hard time adding enough proteins to your meals), cereal bars, etc. And don’t forget the seasoning: have at least salt, pepper, oil and vinegar. You can see it was a mess when we started out (this is the first week!) – but here’s some storage on the right, a mosquito net, and on the left some food stuff. The thing miserably falling in the middle over Simone’s head is one of our first fairy lights before we installed it… Lazy much?! In Simone’s grateful hands? A pack of coffee! • A shower system: One again, you have several options there, the main ones being: a pump shower, a solar shower, a bassinet, or wipes. 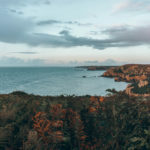 Obviously wipes are not the most sustainable option, but it’s always good to have a pack of ecological wipes lying around somewhere for when you need it (and you’re going to need it). Also remember that water is sometimes hard to get by. At the beginning we had a solar shower who belonged to the van’s previous owners, but it quickly became unusable. We then mostly switched to either just using some water in a bottle and a bassinet for a quick wash, or a watering can (above a bassinet if not possible in the wild) when we needed something more substantial. • A toilet system: As mentioned above, this is the most important van living must have, especially if you’re not going to be around toilets all the time. 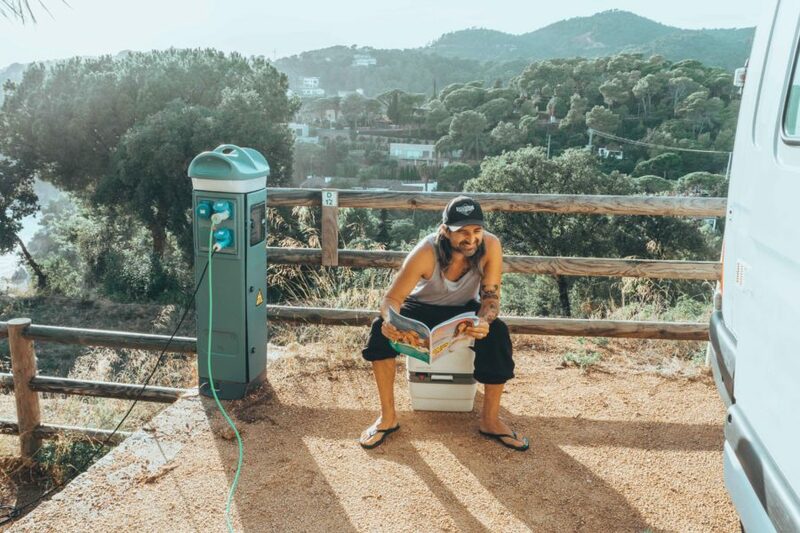 A portable potty is a good solution. It can be chemical, or you can buy or make a compost toilet. You can also use less fancy means like a bucket. Don’t forget the toilet paper!! • Eco-friendly shower products: shower gel, shampoo, soap for your hands, deodorant. Don’t forget that most “eco-friendly” products are NOT friendly enough to be used near natural water sources, including beach showers. Sorry. • Hand sanitizer: very helpful if you don’t have access to a lot of water. • A minimalist makeup bag (or none! ): moisturizer, bb cream, mascara, eyeliner, lipstick, makeup removal product (it’s hard to find the one that will work the best for you in your situation. I personally almost never used makeup while on the road, and mostly used vegetable oil to get rid of it). • A practical travel toiletry bag that you can hang to keep all of your “bathroom” products. Ours is a god-sent and we would never go anywhere without it! • Towels: We had 2 towels each: one for the beach, and one for our cleaning up. If there’s space, taking one more wouldn’t be too much because there’s nothing as frustrating as not being able to use a clean towel after a much-needed shower. We’re not fan of micro-fiber towels but they do save space so, your choice. • Mosquito repellent: A mosquito screen is a must at the doors/windows. Also pack some mosquito spray to put on your skin if it tolerates it (mine doesn’t too much so I save it for critical countries), and a mosquito racket can save your nights! • Sunscreen: Choose it reef-safe if you’re going swimming! • Laundry must-haves: detergent, laundry line, etc. We mostly used laundromats where everything was provided and used dryers, but having your own laundry detergent can be very helpful. 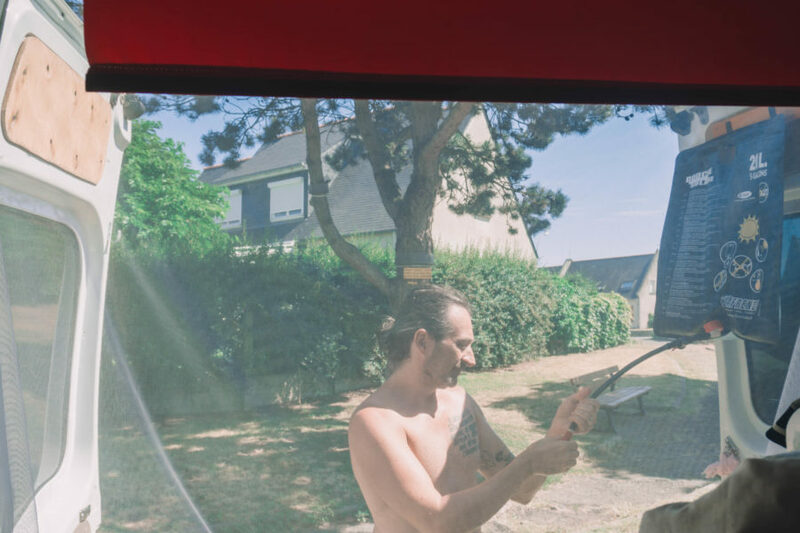 At the beginning, Simone used to hang the solar shower on one of the hooks at the back door of the van and take a shower there after a run in the ocean! • A folding table and folding chairs: we had one built-in but it wasn’t the most practical so we never used it. We had a huge one in the back that was too big, so we threw it away. A table is not absolutely essential, but if you don’t like the idea of eating on your bed or car seat all the time, it’s damn practical! We also regretted not having chairs to get outside of the van once in a while! • Power: When it comes to having enough power, there are again several options. If you’re leaving for a long time and not mostly winter time, investing in solar panels is a must. We didn’t, and we regret it: it’ll be in our next van for sure. Otherwise you could buy a large portable power station (which is even better when you have solar panels! ), especially if you’re planning on working or using a computer a lot while in your van. The cheapest option is to use an inverter (if you have a secondary battery installed like we do! ), but it’s not as sustainable for you as the other options, it’s not impossible that it could damage your leisure battery or your devices (we honestly didn’t get a sound enough answer on these topics to make our minds about it, and we didn’t see any damage after using ours, but we were not using it non-stop either, so we thought we’d still mention the possibility). 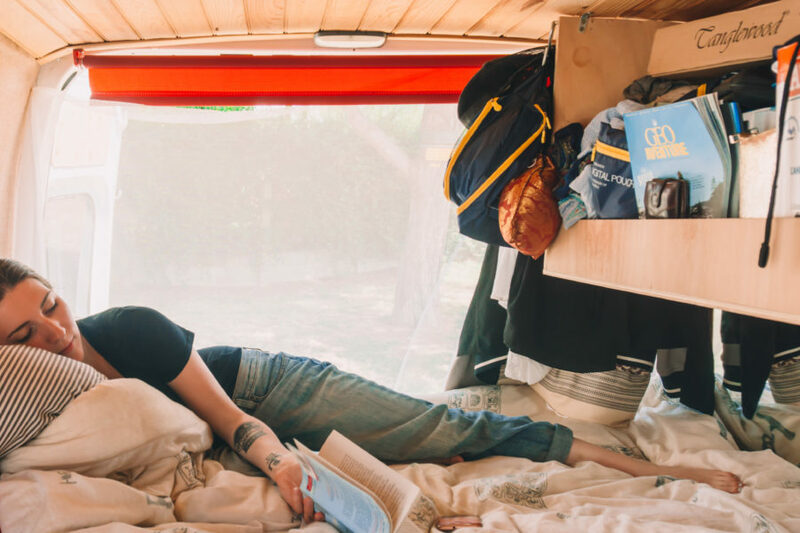 • Storage: unless your van conversion is already super awesome when it comes to storage, you’ll need to use boxes, packing cubes, behind the seat organizers or any type of organizer that you can hook (shoe organizers are awesome). • Air and heat: another thing our van didn’t have: ventilation. Definitely going to have some in the next one! A 12V fan will be great in the heat, and a buddy heater will probably be helpful in winter. But be careful on which model you choose in terms of safety. • Water canisters: it will depend on your water system, but it’s definitely helpful to store large volumes of drinkable water in case you can’t get some for a while. Don’t forget to regularly disinfect it. • Light: ceiling lamps, flashlights, fairy lights. The more the merrier! • Bluetooth speakers: to listen to music while you drive, while you’re parked, and watch movies. Alternatively, noise-cancelling headphones and earplugs are great to have in handy. 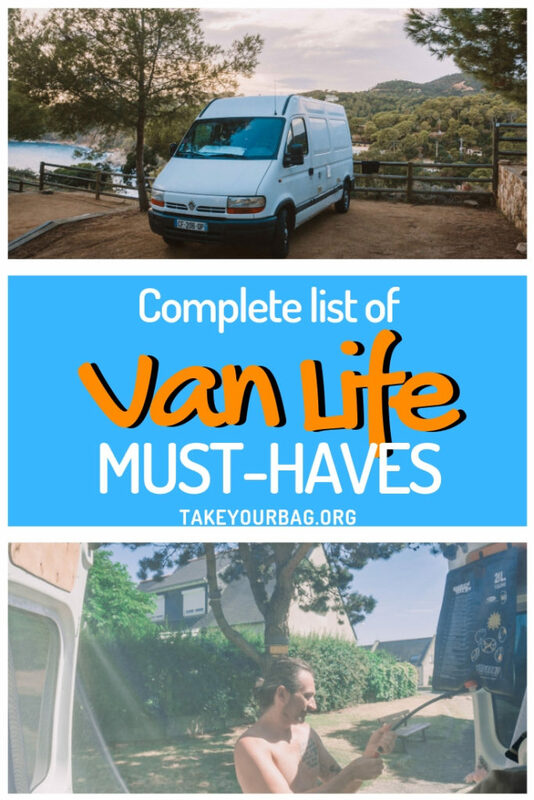 • A dry bag to go around: There’s a good chance you won’t want to leave any of your valuables in the van, and will have to take them with you all the time. For us, the best way to do that in any situation (be it in a city or at the beach, under the rain, etc.) was to use a waterproof bag that we could just fill up with all of our stuff, then put down where we would be. • Cigarette lighter USB charger for your electronic devices and solar chargers. • Entertainment to keep the blues at bay on slow days: books (think about getting a Kindle, I love mine and the new one is even waterproof! 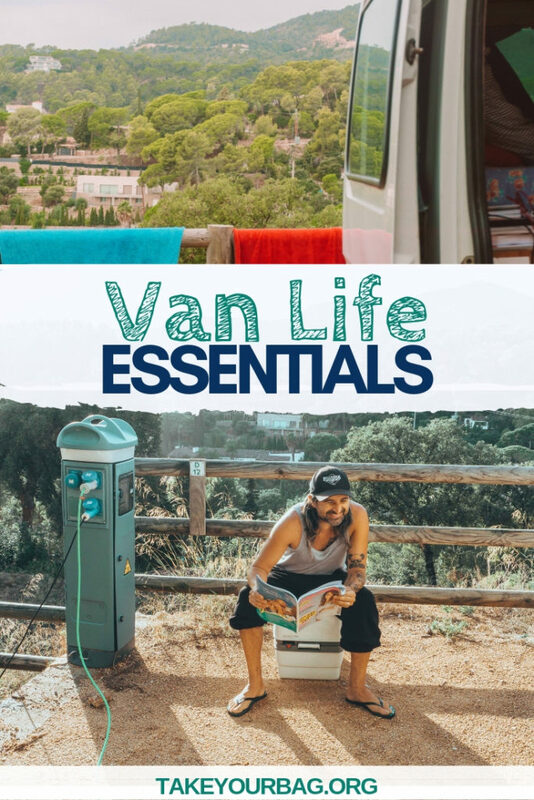 ), boardgames and playing cards, sports accessories (dumbbells, training bands, yoga mat,…), notebooks, pens,… Of course a camera and a laptop are must have items for vanlife, especially if you’re in for the travel part! • GPS: as much as we would love to say it’s not essential, it was definitely essential for us! We only used our phones’ GPS but that’s the very least and we certainly might buy a real GPS for our next van. • Extension cord and special adaptator in case you plan on stopping at campings or RV stops and get some electricity while there. 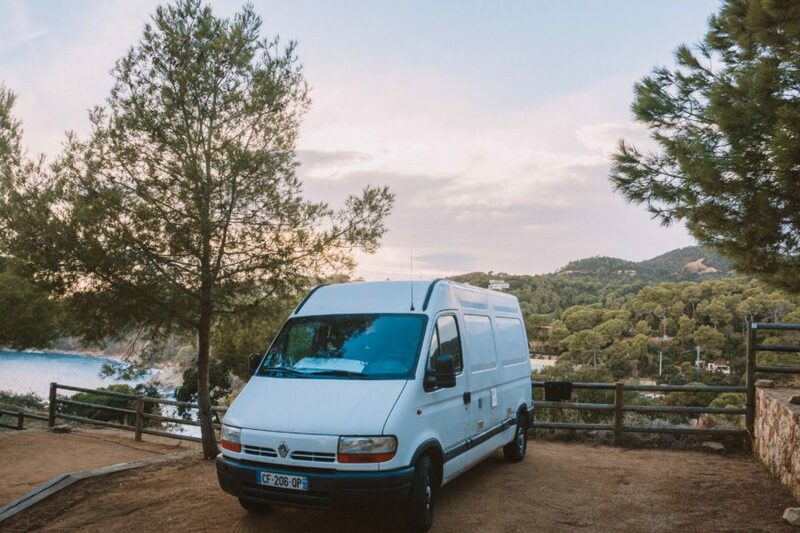 Are you interested in our van trip around Europe? 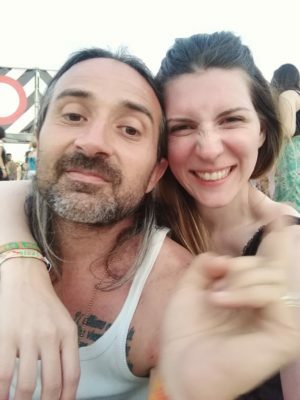 Here are detailed articles on our VanLife! This was SO helpful! Thank you for sharing. we just got our van and I cant wait to set it all up. Thanks again! So happy we could help, Meggie! 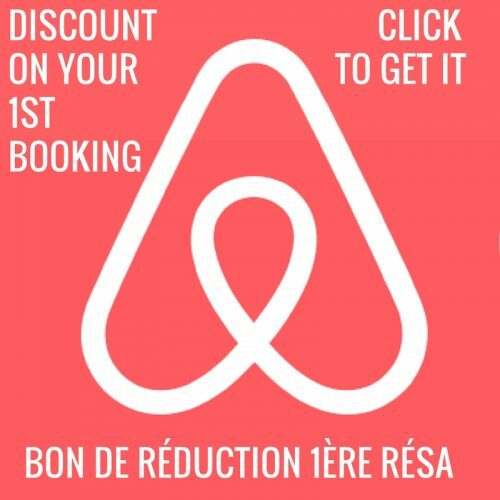 You’re gonna have an amazing time!! Crazy in-depth. Love how much thought you put into this. I always find it hard to think of what I would consider the essentials in our van, but you nailed it.